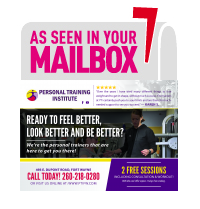 At Personal Training Institute, we’re not like your typical “box gym.” We offer a smaller space for our clients to come in and work in a one-to-one setting with us. We like to keep it that way so we can give 100% of our attention to helping you reach your goals each session. You won’t be judged on how slow you’re going while boxing or how much weight you lift on the chest press. Our staff and members know that everyone starts at different places. Chances are they’ve been in the same spot as you. Each package we offer entails 2 main components: your 30-minute personalized training sessions and your individual nutrition meetings. The packages are designated to be used for one month to help keep you consistent in your workouts. That said, we do have policies to account for vacations or work travel during a package, so don’t worry too much about missing time during those vacations you’ve got planned. Our one-to-one training sessions are 30 minutes. You might be saying to yourself, “Wow, that doesn’t seem long enough to get a good workout in.” Trust us, it is! Within each 30-minute session, our trainers will lead you through your personalized exercise routine, giving you form cues and motivating you throughout each exercise. Within each session, you will perform a combination of upper and lower body movements with cardio intervals and core work sprinkled in. Usually, we’ll get through 12-13 exercises hitting every muscle group to get a full body workout. Our training philosophy uses a ‘one set to fatigue’ protocol. Therefore, you’ll move slowly through each rep to keep the muscles engaged and working until you just can’t get the full range of movement on the exercise. It’s less time consuming than doing multiple sets, but you’re working the muscle just as hard. Also, there’s no jarring movement, so it’s safer on the joints as well. We can easily scale weights to accommodate beginners to those more advanced. Including nutrition into each package was a no-brainer for us. It’s the piece that most people have trouble keeping up on or just knowing enough about what foods to eat and when to eat them. Our experienced Nutritionist meets individually with all the members on a weekly or biweekly schedule to go over any barriers to healthy eating and educating on the importance of food in our diets. We don’t try to shame you on what you’re eating, just trying to help you make better choices all around when it comes to what you put in your body. If you’re looking to make steady progress in losing weight or gaining strength, look here! If you’re looking for faster results, then this package is for you! Getting to work with a group of fun, motivating individuals that are here to help you! *We have other packages above Body Pro up to 6 sessions/week as well as Nutrition Only packages. Feel free to ask if interested.